The MESSENGER space probe is confirming the Electric Universe theory. 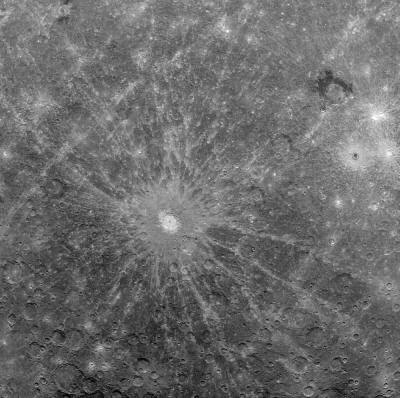 Firdousi, a rampart crater (center) on Mercury, illustrates electric arc erosion. 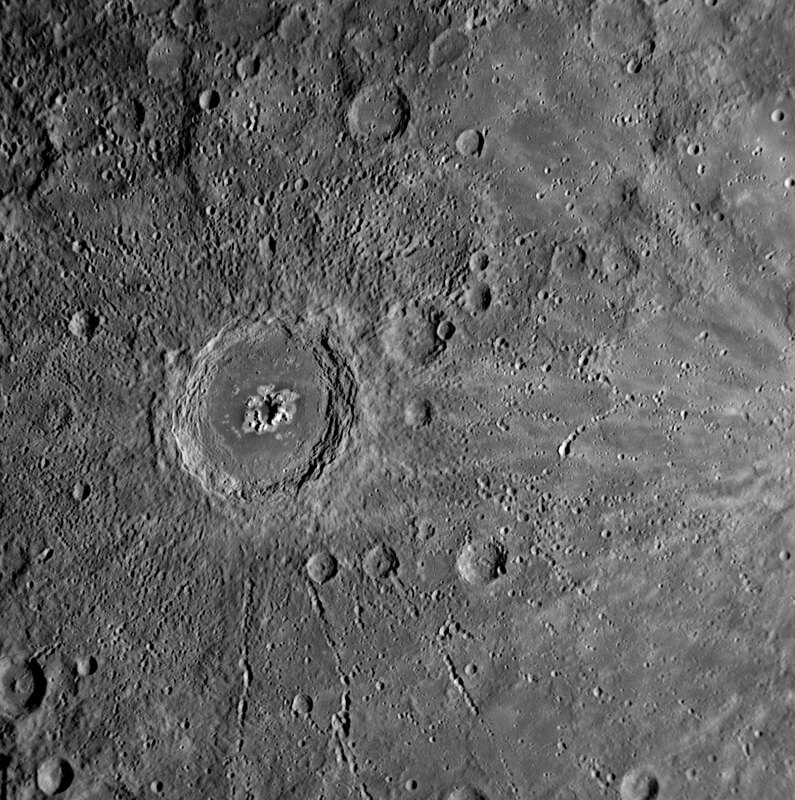 MESSENGER entered orbit around Mercury on March 17, 2011 after traveling nearly eight billion kilometers. its surface is pitted, gouged, punctured, and grooved in ways so like its sisters and brothers that telling it apart from some of them would be difficult. Past electrical activity on Mercury is evident in several locations around the planet. Indeed, the entire planet could be said to exhibit nothing but electrical effects. 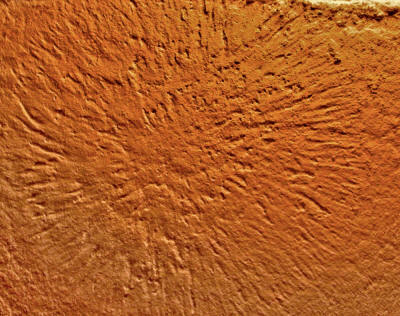 The etched furrows (above image) radiating outward from some craters, such as Firdousi, above, denote the path of untold numbers of electric filaments as they danced a fiery dance across the surface. On Earth, those filaments would have been the largest lightning strikes ever witnessed. In an experiment at Vemasat Laboratories, Dr. C.J. Ransom created the same kind of etched furrow by shocking a thin layer of magnesium silicate with a 120 milliamp, 12,000 volt discharge for five seconds. 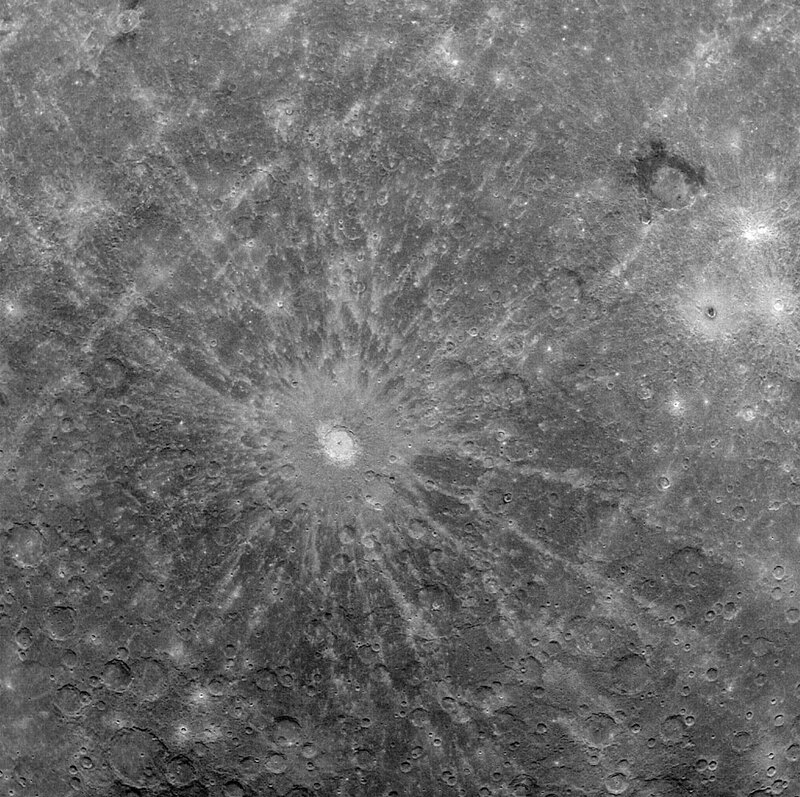 He created radial gouges (above image) on a small scale equivalent to Mercury at the large scale. As pointed out in previous Pictures of the Day, Nobel Laureate Hannes Alfvén thought that electrical (plasma) phenomena could be scalable by as much as 14 orders of magnitude. Since an electric arc is composed of rotating filaments, if electricity were involved in Mercury's evolution, it would have manifested in many ways. 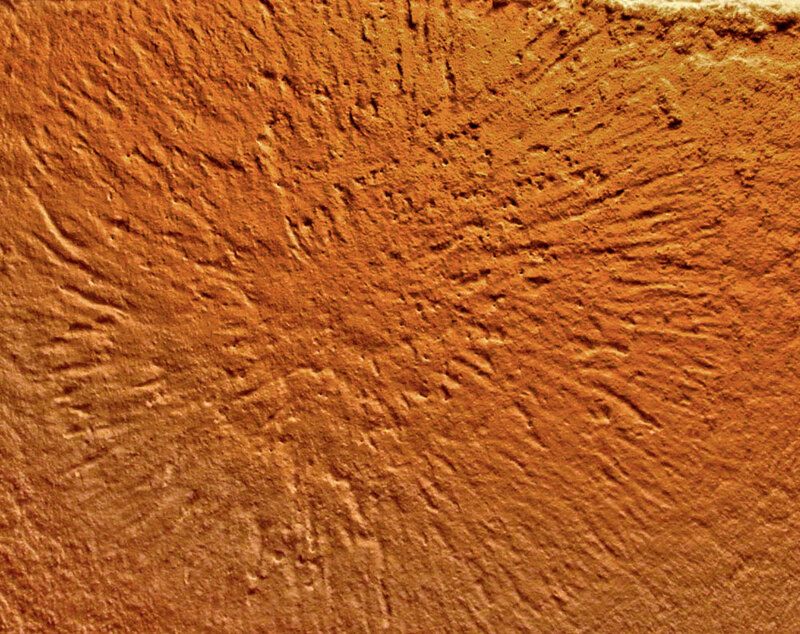 One of those ways would be to act like a plasma "drill bit," cutting steep crater sidewalls, while sometimes leaving a “pinched up” mound in the center. 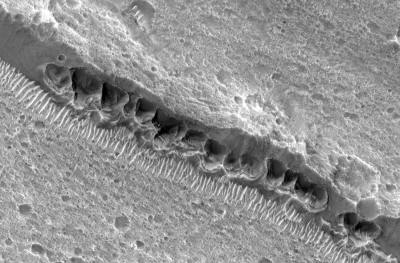 Multiple filaments would cut one crater within another, often with one or more craters on the rims. Firdousi, among dozens of other large craters (below image) on Mercury, conforms to that insight. 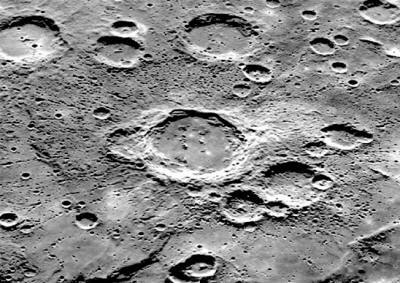 What is most remarkable about Mercury and other members of the Solar System are the numerous crater chains that abound throughout the population. 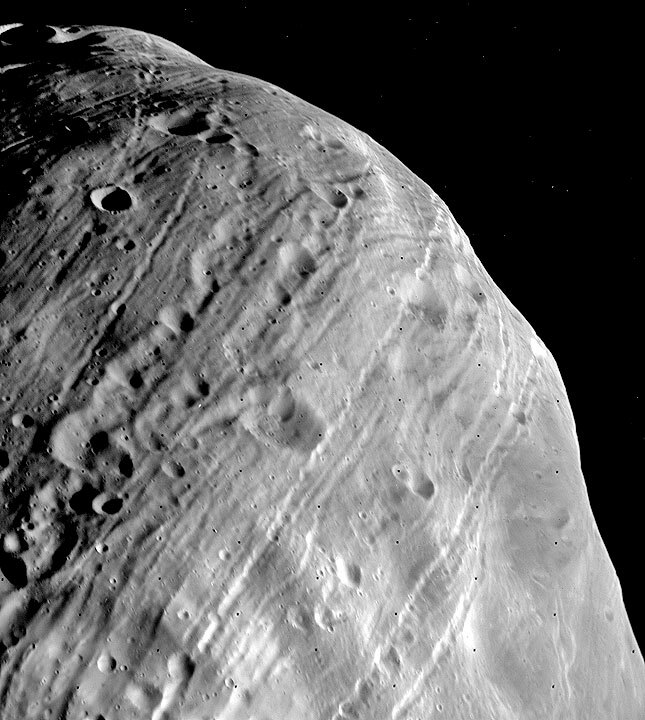 From Phobos (above image) to Phoebe; from Mars to Miranda, planets and moons are pocked with holes (below image 1) that run in long lines (below image 2), sometimes for hundreds of kilometers. The common explanation for them is that a string of meteoroids impacted one after another, one behind the other. The necessary coincidence for that effect notwithstanding, the absence of distortion in adjoining crater walls calls the theory into question. Add to that the twists, turns, loops, and braids that can be seen in many of them and the idea that rocks falling from space caused these features falls apart. 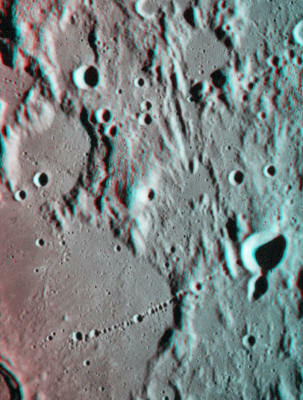 Anyone who has made an electric arc device called a "Jacob's Ladder" knows how the line of craters could have formed. A Jacob's ladder is constructed by placing a stiff copper wire on each standoff of a neon sign transformer and then bending them in toward each other until they form an ever-widening "V" from bottom to top. When the current is turned on, an electric arc begins at the lowest level of the V and then rises up to the top, growing longer across the widening gap until it disconnects with a snap, only to immediately begin again. If a piece of paper is held between the two limbs of the V while the electric arc travels upward, a row of pinholes will be found burned lengthwise into the paper. Electric arcs traveling across a conductive medium vary in strength from millisecond to millisecond, so they burn chains of craters instead of smooth channels. 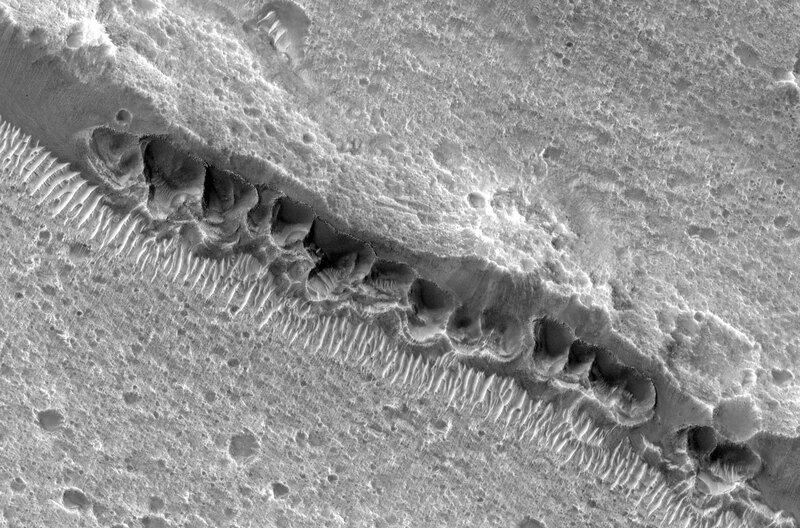 In fact, the "smooth" channels seen on many objects are actually crater chains that are packed so close together that they can no longer be distinguished. 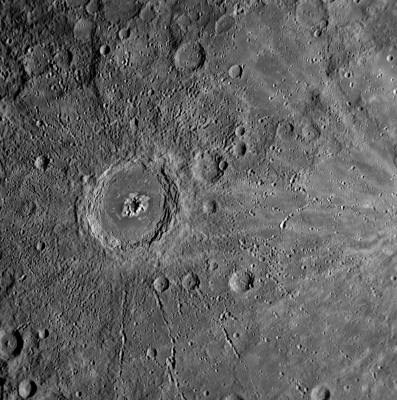 There are more examples from MESSENGER that reveal Mercury's catastrophic past. It is certain that additional evidence supporting the new Electric Universe paradigm will come to light.